My paranormal fiction research takes me into the art world of contemporary times as well as the sixteenth century. When I learned artists often use symbols and archetypes to send messages to tell us the story behind the story of their masterpieces, I was captivated. 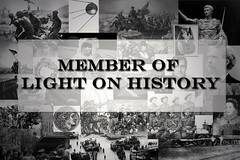 A prime example of symbolism is the fish, a secret mark used among Christian artists in ancient Roman times. Why a secret mark? This was an era where admitting to worshipping Christ was equivalent to signing your own death warrant. Symbols can clue us in on the social and political climate of the day. 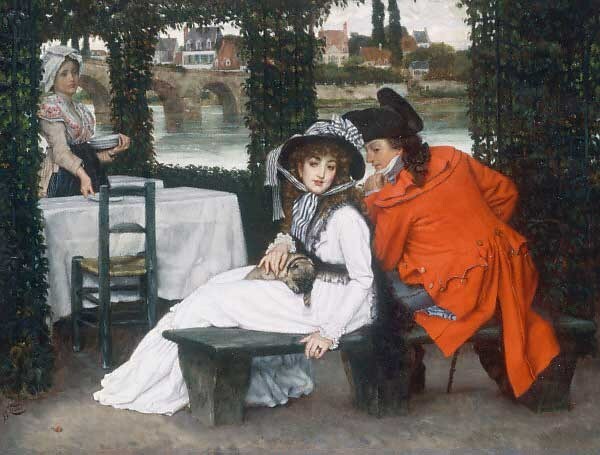 Let’s test her theory and take a look at A Tryst at a Riverside Café by French artist James Tissot c.1869, oil on canvas, Sotheby’s, London, England. Here we have a young man and woman sitting on a bench. He is leaning into her and it looks as though he’s whispering in her ear. Let’s look deeper and “read” the symbols. The whiteness of her dress signals her innocence. White is also the color of initiation and rites of passage, weddings, baptisms. However, the touches of black suggest she could have some opposite traits. Hmmm… a flirt? Look closer. That cute little lap dog is more than a fashion accessory, it symbolizes marital fidelity. However, the dog’s outstretched paw points to the ring on her left hand. Her little companion is ratting her out! Is the ring an engagement ring or a wedding ring? Furthermore, a ring is a symbol of unity and eternity. Does this ring bind her to another man? The man is wearing red which is a symbol of danger or it can be linked with warmth and overheated emotions. By virtue of his body language and his cocked hat it looks as though he’s trying to talk this Victorian lady into making a life changing choice. Look at the background again. Bridges are symbols of transition – crossing from one stage to another. Water is a feminine symbol. Stately family homes line the other riverbank. Could they symbolize her future or her past? Why the dreamy look from the waitress? Lastly, there is something I might have missed if I’d been looking at this in a gallery. When you’re studying symbolism, nothing is inconsequential. On the far left bottom corner there is something on the ground. It will show up as a mere speck on the blog. It’s uh… a piece of sausage. Could Tissot have intended it to be read as a phallic symbol? Or is a piece of sausage on the ground just a piece of sausage on the ground? I’ll leave the meaning of that symbol to you. That’s part of the fun. Maybe Tissot simply has a good sense of humor. He certainly was a wonderful artist, don’t you agree? Let me know what you think about today’s post and feel free to leave a comment!